Asus ZenFone 3s Max Review: A necessary upgrade or not?Asus ZenFone 3 Max Review: A Slim Phone + Long-lasting BatteryAsus Zenfone 3 Review: OnePlus 3’s CompetitorAsus ZenFone Max Review: Is This A Phone Or A Power Bank? First and foremost, don’t get confused. We are going to review the *new* or *updated* ASUS ZenFone Max in this post. ASUS recently launched this smartphone in a very minimalistic way and I totally loved it. We already did a review few months back and that was the old version. I’m honestly confused with the name and I even conducted a poll on our DeviceBAR Facebook group about the blog post title for this review. I don’t want to confuse our readers with two reviews with the same smartphone name. Let’s get back to the review! 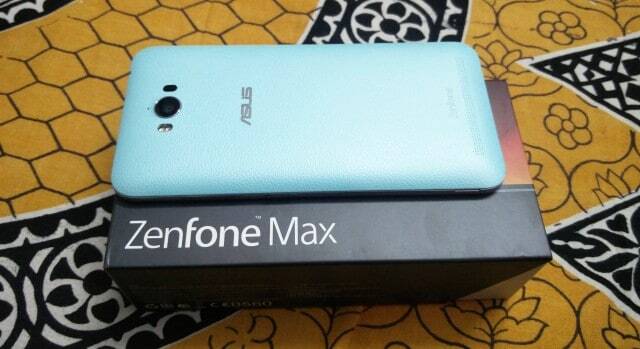 Asus Zenfone Max comes with four colors at the moment, they are Blue / Orange / White / Black. We got the Blue version for reviewing, and I’m not really big fan of it, but it looks cute. At first, I thought this will be a heavy smartphone considering the mammoth 5000mAh battery, but it’s pretty decent IMO. I had my OnePlus 2 in one hand and ZenFone Max on another hand. I don’t know whether I’m stronger or not, but I feel comfortable holding it. It weighs around 204 grams. No comments about the design, I’m badly expecting a revamp soon. The upgraded ‘Max’ phone has a premium looking leather pattern backside with Metal-effect bezel, but the same old front design. This device has a 5.5-inch (13.97 cm) HD IPS display with 720 x 1280 pixels resolution + Gorilla Glass 4. It’s such a beautiful display, I loved watching TED videos every morning with this phone. 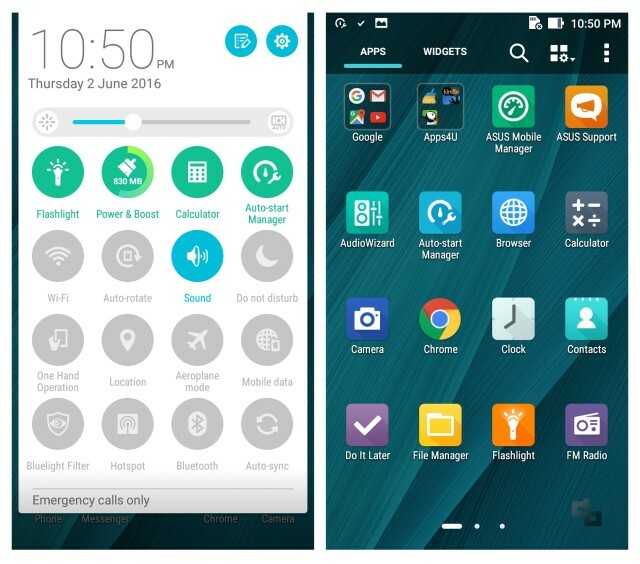 Thanks to Android v6.0.1 Marshmallow, the ASUS ZenUI looks clean and lovable. But I’m a big fan of Stock Android any day. I’m the kind of guy who totally hates Bloatware. This device boosts 1.5GHz Qualcomm Snapdragon 615 – Octa-Core. The other version has Qualcomm Snapdragon 410 Quad-Core. 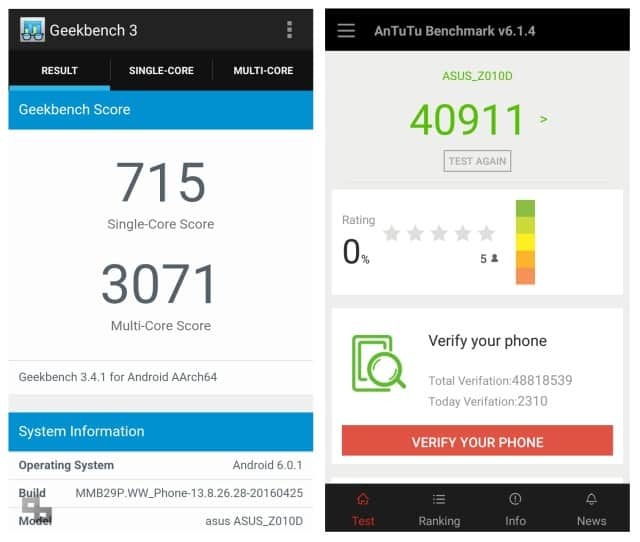 We used AnTuTu Benchmark and Geekbench 3 tools for checking the benchmark score. We shared the scores below for your reference. It’s not a laptop or PC to edit videos and run advanced games to check the performance. But we tried playing HD videos + played powerful Android games on the smartphone. I didn’t really want to test this as I’m testing the latest iPhone, but since it’s a moderate budget phone, it’s performing more than we actually/honestly expected. It kinda heats now and then, but it’s normal with such smartphones these days. It has both 16GB / 32GB internal storage space and it can be expanded up to 64GB (microSD). They also provide you 5GB free lifetime ASUS WebStorage + 100GB Google Drive space for 2 years. Even though it’s a budget smartphone, ZenFone Max has an amazingly good camera. Talking about the front camera (selfie), we got 5MP with wide view F2.0/85 degree. Thanks to the wide angle degree view we can now cover plenty of people with the selfie mode. ASUS also optimized their rear camera with 13MP. They got Real tone dual LED flash, laser focus, and autofocus F2.0/75 degree. They are powered by Pixelmaster technology, and the pictures are quite crispy. Okay, so it’s time to talk about the major USP of this smartphone. Yes, the battery life. Whenever I talk about battery life and mobile phones, I can only remember about the good-old Nokia devices; they practically need no charge for days. But thanks to ASUS, now at least other smartphone competitors will try to copy this feature and implement on their devices. Why should they? Because it’s an insane 5000mAh battery power (non-removable polymer battery). 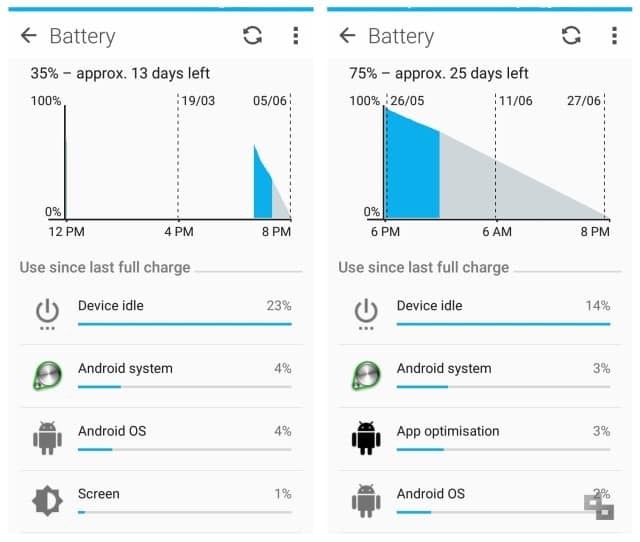 Now, the old ZenFone Max also got the same battery life, but this one seems to be more optimized than that. I used this smartphone for a week and used it continuously. As a tech reviewer and as an average smartphone user, I did everything I could think, let it be games, videos, photos, applications, phone calls, GPS, and much more. I didn’t force myself to extremely use all things that could drain the battery, but I did everything I (and hopefully others) generally use. First Scenario: I inserted a microSD memory card and a micro SIM card. Second Scenario: I inserted a microSD memory card and two micro SIM cards. I could freely use this smartphone for 2-3 days continuously (or more if optimized well) without any issue. Last but not least, you can use this as a power bank to charge other devices (we got an OTG cable as well). This. Is. My. Favorite. Feature. We got two micro SIM options on this smartphone. I tried it with both my Vodafone and Airtel SIM cards (both are 4G). I couldn’t really travel anywhere and check the connectivity or the quality properly. But I’m staying in Chennai, I used it as a primary smartphone for like 3-4 days, made some phone calls and used to browse the Internet. It’s pretty clean and perfect for making smooth conversations. No connectivity issue so far. Will use it for some weeks and update you further here. So, finally, the final conclusion. I used this device for ten days continuously, and my major focus was the battery life + performance. We all know which is the biggest pro here. The battery life. And yes, also the price, which is pretty decent when compared to others. Same old Design and UI. Though the device feels good in our hands, I’m somehow getting irritated by the same *feel*, and it’s kinda heavy as well, especially when you compare it with your current smartphone. Moreover, you can’t practically make others realize that you own a new *ZenFone* device unless you tell them it’s not the old version but the newer one. Even if you have ZenFone Max, they’ll ask you “What’s the cost of the ZenFone 5 you are holding?”. It’s hard for everyone, let it be geeks or amateurs. This device is available for purchasing now, you can grab it on both Amazon and Flipkart. The price varies for 2GB & 3GB RAM version. Considering the decent price + heavy battery life, I think this is a top-notch phone. I’m not really a big fan of their Design or UI, but since this is a budget smartphone, we can forget them and settle down.